Dolphin Tail 2 engages the audience from the beginning and keeps us watching. It isn't that often that a sequel is better than the first film, but with Dolphin Tail and Dolphin Tail 2, that is exactly the case. You can pick up both movies now for the holiday season. The four disc collection is a must have for any young animal lover in your life. In Dolphin Tail, we meet Winter, a beached juvenile dolphin who ultimately had to have her tail amputated due to infection. When Winter's awkward swimming technique threatens her life a young boy seeks the help of a doctor at the Veteran's hospital who makes Winter a prosthetic tail. With the new ability to swim, Winter becomes a beacon of hope for people all over the world who have lost limbs and for the failing aquarium and marine hospital that saved her life. When Dolphin Tail 2 opens, Winter has a happy life in the care of the Aquarium that rescued her. However, she ends up isolated and depressed when her playmate, Panama, unexpectedly passes away. Per federal regulations, the aquarium needs to find a new playmate for Winter or risk having her transferred to another facility. Meanwhile, Sawyer (Nathan Gamble; Marley and Me), Winter's human friend, is offered an opportunity to attend a semester at sea and must decide if he should go and leave Winter. Sawyer is a boy who is, at first, shy, lost and reserved, but becomes more self-confident and open as he spends time with Winter. In true "family friendly" entertainment, Sawyer and Winter end up "saving" each other. Gamble does a wonderful job as a troubled boy in Dolphin Tail and an older, more self-assured young man in the second movie. Surrounding Gamble is an all-star cast. Harry Connick Jr. (Hope Floats) plays Dr. Clay Haskett, the owner of the Marine hospital and aquarium. Kris Kristofferson (Joyful Noise) plays Clay's father. Ashley Judd (Divergent) is Sawyer's single, working Mother and Morgan Freeman is Dr. Cameron McCarthy who created and fits Winter for her life saving prosthetic tail. While all of these celebrities do a good job, the real surprise is Cozi Zuehlsdorff (Liv and Maddie) as Dr. Haskett's daughter. In every scene that she is in, the focus is immediately drawn to her. She has a certain intangible quality that draws the viewer in. The movies have the cheesy mentality you would expect of a family film with a human interest bend and the CGI is sometimes obviously fake. However, in Dolphin Tail 2, a number of the underwater scenes are beautifully shot and give a feeling of serenity and calm. Presented in 1080p High Definition video, the second film is crisp and clear and I have to say the 3D version of Dolphin Tail is terrific. Many times, I don't enjoy 3D movies because I don't feel they enhance the story or viewing experience. In Dolphin Tail, though, I truly enjoyed the experience of watching it in 3D. The DTS-HD Master Audio is simply what you come to expect of Blu-rays. While the extra features for Dolphin Tail 2 are numerous, they are short in length. There is a cute blooper reel and a music video by Gavin DeGraw for the title song. "Look Who's Running the Show" gives the audience an insight into the young stars, Gamble and Zuehlsdorff, and how they have matured both physically and emotionally from the first film to the second. The segments about the Clearwater Marine Aquarium and Winter's and Hope's stories were interesting. "Under the Water" discusses with the young cast how swimming and working with Winter was enjoyable. 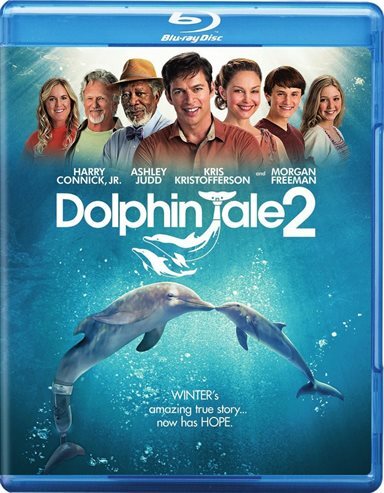 Download Dolphin Tale 2 from the iTunes Store in Digial HD. For more information about Dolphin Tale 2 visit the FlickDirect Movie Database.